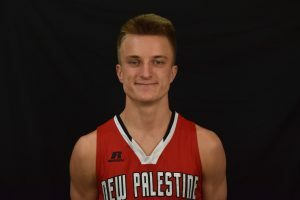 As soon as the New Palestine boys basketball team surrendered the lead Wednesday night, the Dragons seized it for good. 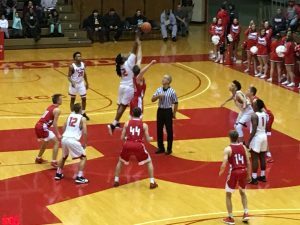 NP scored the final seven points in Wednesday’s season opener to beat host Richmond 49-42 at the Tiernan Center. The opening tip of the 2017-18 season. 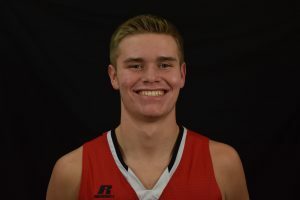 After Richmond’s Rickie Wedlow hit a long 3-pointer to tie the game at 42-42, capping a five-point Richmond run, Maximus Gizzi drew back-to-back fouls and calmly sank all four free throws – sandwiched around a Red Devil turnover – to put NP up 46-42 with 1:12 left. NP’s defense then forced back-to-back misses. The Dragons turned it over after the first, but ran a lot of clock on the second. NP capped the possession with Dawson Eastes hitting two free throws with :22 left to ice the game. Eastes hit another foul shot after another Richmond miss to set the final margin. Gizzi scored nine of his team-high 17 points in the final quarter, hitting 7-of-8 from the line in the quarter and 13-of-14 for the game. Eastes scored five of his nine points in the final quarter, also hitting a big shot early in the period. NP took the lead with a 10-1 first-half run, which was sparked when Dylan Romine came off the bench and hit hit back-to-back first-quarter 3-pointers. That spurt put the Dragons up 16-11. NP led 28-25 at the half, with Christian Harvey carrying the game for Richmond. He scored 17 of his game-high 25 points before halftime. The Dragons extended the lead to five at different points in a low-scoring third quarter before a late Richmond 3-pointer cut the lead to 35-34. NP opened the fourth with a 7-3 run to take a 42-37 edge before the Red Devils again answered. Romine added eight first-half points for the Dragons. Matthew True scored six points, while Jack Walker tallied four first-half points. Maxen Hook and Gavin Hausz scored two each, while Kyle King hit a third-quarter free throw. The Dragons (1-0) next play Dec. 1 at Shenandoah. Dawson Eastes scored nine points, including five in the Dragons’ fourth quarter. Maximus Gizzi scored nine of his team-high 17 points in the fourth quarter.